Vero Beach SantaCon gets underway. VERO BEACH – SantaCon 2017 will be Friday, Dec. 8 from 8:00 p.m. – 11:00 p.m. in Vero Beach to benefit the Healthy Start Coalition. 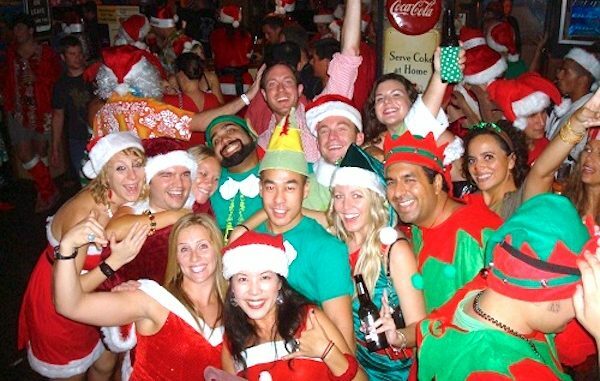 SantaCon will take place in Downtown Vero Beach for a pub crawl decked in your most festive holiday getup for the best costume prize, and participants can enjoy 15% off their bar tabs all night long with your $10 donation to the Healthy Start Coalition. Special Guest Elf, Richard Giessert, will be donating the funds raised for his contribution to Dancing With Vero’s Stars, a non-profit event that raises money for the Healthy Start Coalition. You may purchase your SantaCon2017 Wrist-Bands for $10 from A1A at the event. This is a Pub Crawl style event. Participants will be walking to the local establishments in downtown Vero Beach. You may park your car in the parking lot across from our 1st stop, Kilted Mermaid. If you plan on drinking, please consider finding a designated driver at the start of the night, or call KlubKar (772-778-8287) or download the Uber app to your phone so you can get home safely.